RV Tire Safety: SAFETY WARNING Sidewall "Blowout"
Having a tire sidewall failure is one thing that can really spoil an RV vacation. What some fail to realize is that there is also the real potential of personal injury if a tire "blows out" when someone is near by. The Rubber Manufacturers Association has published some guides on the proper way to handle this potential safety issue. I would like to offer part of that information here. My intent is not to scare you but to inform you that working with tires with high inflation levels is not an activity to be taken lightly. There are practices and procedures that need to be considered if or when you are confronted with the need to inflate or re-inflate your tires. Steel body tires are usually large tires such as 19.5" and 22.5" but some 16" and 17.5" tires also have steel body cord. You should know what is in your tires and this information is molded on the sidewall of all tires. The material - Steel, Nylon or Polyester are used in most tires today. What we are primarily concerned with is the material in the tire sidewall. Steel body tires can damage their body cord, no matter how low a speed, if the tire sidewall is over-flexed. Over flexing can occur because of over-load or under-inflation or a combination of the two conditions. According to the RMA "Permanent damage due to operating a tire underinflated and/or overloaded cannot always be detected. 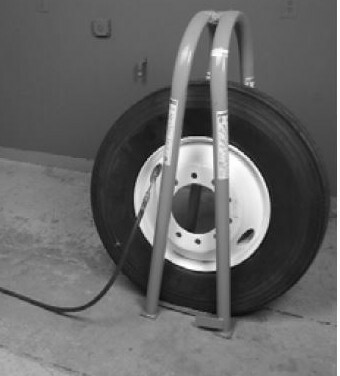 Any tire known or suspected of being operated at 80 percent or less of normal operating inflation pressure and/or overloaded could possibly have permanent sidewall structural damage (steel cord fatigue). Ply cords weakened by underinflation and/or overloading may break one after another, until a rupture occurs in the upper sidewall with accompanying instantaneous air loss and explosive force. This can result in serious injury or death." In other words, if your normal inflation is 100 psi but you discover you have a tire with 80 psi or less you should NOT re-inflate the tire yourself. If you discover a tire has lost 20% or more of its pressure while being operated you should step away from the tire and contact a service company. All the air should be let out of the tire by removing the valve core. is also required. The tire is inflated in steps, with the valve core removed. I know that many people have posted questions on various RV forums asking about what compressor to use to air up their tires, but I am concerned that few realize the potential danger of inflating a tire that has been damaged. Even with 40 years' experience of inspecting tires I cannot be 100% certain the tire has not been damaged. The best thing to do if you have any question is to have the tire demounted and inspected by a qualified technician at a tire store that sells the type and size tire you have. Not every tire store has the proper safety cage to inflate high pressure tires. IMO, having a TPMS is one of the best ways for the RV owner to know if a tire is losing air so the RV can be stopped before the tire has lost significant air pressure and is still driven on. I don't understand why more people do not use a quality TPMS for their coach, car motorcycle, etc. I will NOT leave home without one running on the vehicle I am driving. I prefer the Tire SafeGuard TPMS as it has been reliable accurate and trustworthy. 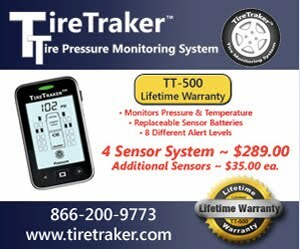 I use a 10 tire sensor system, 6 sensors on the coach and 4 sensors on the trailer or car depending on what I happen to be towing. When at my destination I use the 4 sensors on my car while touring around town, etc. I also have a two tire motorcycle TPMS that is invaluable when riding the bike. Who is responsible for tire warranty service?